As a company Dust Control Solutions Ltd have designed and provided systems to improve the client’s environment with the control of dusts and fume as highlighted on our gallery. Every enquiry is designed individually to suit our perspective client’s specific needs, we do not provide systems from a standard catalogue, our extensive product range we incorporate in our quote includes equipment from leading manufactures based in the UK, Denmark, Belgium and Germany, assuring all extraction equipment supplied is of the best quality comes with a 2 year warranty and fully complies with current regulations and when required complies with the ATEX European Directive for hazardous explosive dust. 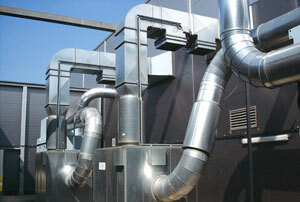 Amongst our design specialities are extraction systems handling potentially explosive dusts like Titanium or Aluminium, these dusts are extracted through wet collectors and all equipment used are covered by ATEX directive, our wet separation systems incorporate fully earthed extraction piping and ATEX non return dampers. We also provide cartridge filters for fine dusts, welding fumes and in the food industry for sugar and flour, all filters incorporate reverse jet cleaning, also when required the units are fitted with approved Fike explosion panels. 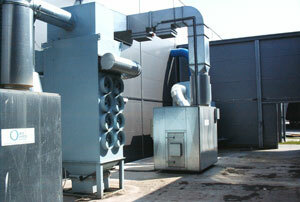 We have designed and supplied large woodwaste extraction systems for furniture manufactures, cooperages and sawmills, our systems are mainly filter socks with regeneration cleaning fans, wood burning plant and shredders have also been supplied, our systems can incorporate return air back into factory area, these systems have anti-static polypropylene filters that can handle filter load of 80-120 m³/m²/hour depending on type of dust with a dust emission ≤0.2 mg/Nm³. Paint fume extraction dry back or wet have been supplied and fitted, these system can be localised within a paint room or alternatively a semi-enclosed open faced booth, all systems complying with current regulations. We provide services throughout Scotland, England, Wales and Ireland, including: Glasgow, Edinburgh, Aberdeen, Newcastle, Carlisle, Stirling, Dundee, East Kilbride, Belfast.